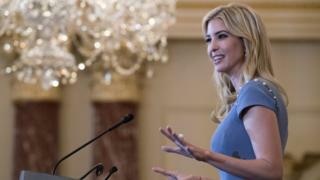 Three undercover activists investigating a company which made shoes for the fashion line of President Donald Trump's daughter Ivanka have been released on bail. New York-based China Labor Watch (CLW) said its investigators would be put on trial at a later date. The group says it has uncovered evidence of pay violations and physical violence at the Huajian group. The Ivanka Trump brand says the company has not made shoes for it since March. However, CLW said it had obtained production schedules for May and June which contained orders for the brand. The Huajian group denies accusations of forced overtime, low wages, and other abuses made by CLW. The accused worked undercover at Huajian factories which CLW says also manufactured products for other brands. Su Heng, Li Zhao, and Hua Haifeng were detained separately in late May after taking part in the investigation. The Chinese authorities said they had been detained for using illegal surveillance equipment. CLW said the trio's actions had not constituted crimes but admitted it had collected a series of pictures and eight hours of video footage during its investigation. Workers at the shoe factories laboured for 15 hours a day, the group alleged, and up to 18 hours at busy times - sometimes finishing at 01:30 and returning to work at 07:10. No overtime was paid, and workers who resigned were not paid, CLW said. "Management frequently verbally abused and sometimes physically hit workers," it added. It also alleges that the company fined workers for being absent, deducted the fines from their pay and fabricated pay slips to show higher amounts than workers were actually paid. Ms Trump has not directly commented on the controversy since it first emerged in May, though CLW said it had written to her on two occasions. She continues to hold a stake in the business but works in her father's White House administration. CLW's director, Li Qiang, said that as the US president's daughter, and holding a White House role, she had "power and influence" to directly intervene. "However, based on what we have seen so far, she has left us very disappointed," it said.